Happy New Year! 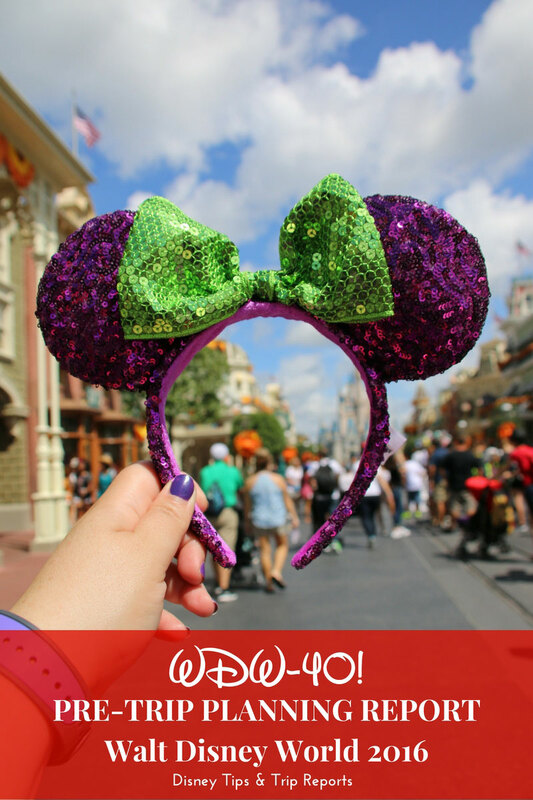 Long time no blog over here on Disney Tips & Trip Reports! I hope you had a good festive season, and are maybe busy planning a Disney trip for 2017?! I am preparing my photos, notes, and thoughts for my huge Disney Trip Report 2016: WDW-40! Back in September of 2016 I turned 40, and to celebrate we went on a month long holiday to Florida, including 3 weeks at Walt Disney world. For all of my other Disney Trip Reports I have written a Pre-Trip Planning Report, but didn’t actually write one until very last minute (just a few days before leaving!) for our 2016 vacation to Florida. My Trip Reports (Trippies) and Pre-Trip Reports (Pre-Trippies) started life on a Disney forum that I belong to – The Dibb. Members write a Pre-Trippie to tell other members about their upcoming Disney plans – as well as a bit about them. It is also a way to get insight from other forum members about things to do, places to eat etc. So if you are completely new to reading my Disney Trip Reports, you’ll find this Pre-Trip Planning Report 2016 an insight into who we are and what we plan to do! The name of this trip is WDW-40, because we are on holiday celebrating my 40th birthday! We are going for a day shy of a month, the longest we’ve ever been, and I cannot wait for this break. I’ve had a rough year – mentally, emotionally, and physically, and I’m taking this holiday as a chance to re-charge and get my mind in a better state to tackle my problems head on when we come home. It’s our first trip as Disney Vacation Club Members too! We bought our DVC in October 2015, and were given a bonus set of points, which we decided to use to splurge for this 40th birthday trip. That said, I struggled last year with all the walking, and so, I hired an ECV from Disney for a couple of days. Which you can read in last year’s highs and lows. To that end we’ve hired one in advance from Beuna Vista Scooters for the duration of our trip because I DO NOT want to be in pain, and miserable on this holiday. I know that people think fat=lazy, and believe me, if I could walk all day I would, but I just can’t. I have worked so hard for this holiday, and if being able to get around in comfort means using an ECV, then so be it. I can deal with stares and smirks. We’ve hired a mini van to transport the ECV around, which of course has added extra cost to the holiday that we hadn’t planned, but it is what it is. FYI, for those who have followed my weight loss journey/pain on my other blog, it’s not been for the want of trying this past year. If you are my size, or any other plus size, and are trying to lose weight, I will always advise – do the very best that you can, because it does make a difference! At a size 24/26/28 I was pretty much fine with walking around, fitting on rides etc without a care in the world. Size 30/32, and dare I say even a 34 it’s more of a struggle. I could carry on hating myself, and hiding away, but that means I’m not living my life, and I have to somehow do that. I do have a blog post somewhere with tips for plus size Disney visitors which I will share in a separate blog post. It feels so weird that it’s just going to be Steve and I! That’s definitely new for us! We have never been abroad together as a couple, so visiting Orlando as just the two of us is going to be, I think, awesome! It’ll mean we can have a few too many drinks if we want to, and do more grown up things, or things that Liam would actually find boring. But, we’re not going to be completely alone, as my brother and his fiancee, Meg will be joining us for 2 weeks. They arrive the night before my birthday, and we plan on hanging out during their two week stay. It was on my bucket list to go to Walt Disney World with my siblings – I wish we could ALL be there for my 40th, but both of my sisters work in education, so time off work in September is out of the question for them 🙁 One day… when I win the lottery… I’ll take us all! Thanks to all our DVC points, we are doing several split stays on our holiday to Florida this year. It’s going to mean a bit of re-packing, and some organisation, but we are both really excited about the different resorts that we will be staying at! Our holiday will actually start with a night at the Hyatt Regency Orlando hotel, which is inside the airport itself. Our flight lands early evening, and we didn’t want to be driving the 2+ hours it will take us to get to our first Disney resort after a long flight, and time difference. You see, our first stay isn’t actually in Walt Disney World, but at Disney’s Vero Beach Resort on the Atlantic Coast! We are spending 5 days there, before driving home to Disney’s Polynesian Village Resort. I say home, because, the Poly, is our home resort – that is where we own a property, thanks to DVC. I can’t wait to stay at this resort. I fell in love with it, when we first visited it in 2013, and vowed to one day stay there… and here we are in 2016, staying at that very resort! We are then moving on to Animal Kingdom Lodge – Kidani Village, for a week long stay. This is another deluxe resort that I have always wanted to stay at – I think it is just beautiful! Our friends are DVC owners at this resort, and I know how wonderful they think it is. And, because of the way points work with DVC, we tagged on an additional day and night at Disney’s Saratoga Springs Resort & Spa – this was only so that we could be in Walt Disney World for the 45th anniversary on the 1st October 2016. We are on the wait list (in the hope someone cancels) for a resort closer to Magic Kingdom, but whatever happens, I’m going to make sure we’re up bright and early to be in the park. I don’t know if they actually will do anything to mark the occasion (I hope they do! ), but I know I want us to be there for this special day in its history. Planes & Automobiles – getting there, and getting around! We’ve flown to Orlando with British Airways twice now, and as such, have collected enough points for a decent discount on flights. So that’s who we are flying with again this year. The airline fly from Gatwick to Orlando International Airport, and we’ve always had a good flight and service with them. Because we’re flying out of high season, with just the two of us, and have a discount, the flight prices were so much cheaper than we’ve ever paid before (we usually go in August, when prices are high, and in 2015, during October half-term, so ditto), and just over £1000 for the two of us. For us this is cheap, when I look back at what we’ve paid in the past (I keep a record! ), per person the cheapest we’ve ever paid was £680 each! We are staying at the Premier Inn at Gatwick North (again) the night before, so we can do twilight check in and all that stuff. When we initially booked this holiday, we had arranged car hire through Alamo – a Chevrolet Impala – my favourite car to drive in Orlando! But plans changed, and because we needed to be able to take the ECV with us to different resorts, shopping, theme parks etc., we hired an accessible mini van from Florida Van Rentals. This did effectively double what we would have paid for a car, but that van hire was a life saver for me. I hope by our next trip I won’t need to use an ECV any more, but if I do, then I wouldn’t hesitate to rent from these guys again. Because my brother and his fiancee are going to be spending two weeks in Orlando with us, and they want to do as much as possible, we are going to be cramming everything in! It’s been several years since we’ve done ALL the theme parks in one holiday – the last time being 2013 – so I hope Steve and I’s old bones can handle it!!!!!!!! This is also the first time since 2013 that we have had to buy tickets from a ticket agency, because for the past two years, we’ve bought them from Disney direct when booking our hotel. In the past we have used Attraction Tickets Direct, and didn’t hesitate to use them again for the big 40th birthday trip. I like that you can pay just a £10 per person deposit, and pay it off in instalments. They provide real tickets, and not just e-tickets, and have free 7-day delivery. You can pay to have your tickets delivered the next day if you wish. I know how exciting it is when the envelope of tickets drops through the door! Throw in the other things we’ve got planned, and I think we’re going to need a holiday to get over the holiday! We did look into buying the Disney Dining Plan, but realistically, it wasn’t worth it. We are not doing Disney exclusively this year, so will be eating off site, plus going with my brother and sister-in-law means we’ll be dining together sometimes too. The Disney Dining Plan isn’t so attractive paying in full when part of it is free as part of your booking, like it was in the past! That said, we have booked some Disney restaurants – both on our own, and with them two. The ones with * are all together. ‘Ohaha – for our first night at Polynesian. Tiffins – because it’s new at Animal Kingdom. Crystal Palace* – all of us on my actual birthday in Magic Kingdom. Tusker House* – our favourite breakfast restaurant! At Animal Kingdom. Jiko – one of our favourite signature restaurants, and our first night at Animal Kingdom Villas. Afternoon Tea at Grand Floridian – because I ♥ afternoon tea! Brunch at California Grill – on our last morning before flying home. We’ve booked two nights at Mickey’s Not-So-Scary Halloween Party!! One before my brother and girlfriend arrive, and one with them. We LOVED the parade and fireworks so much last time and can’t wait to see them again. I also have a new camera, so wanted lots of opportunity to take photos for my blogs! We have book to see Cirque du Soliel – La Nouba as it’s something we’ve wanted to see but not got around to doing so. We also have tickets for Club Villain at Hollywood Studios, which is an evening with 4 Disney Villains, with music, food, and dancing – I’ve heard it is a very good event, so looking forward to that! And finally, there is of course the Epcot Food & Wine Festival, which we plan on going to several times! It’s not a Disney holiday for me without taking a million and one photographs! It’s a bit of a change this year for me, as I bought myself a DSLR and several lenses at the start of the year, so I’m hoping to get some more decent shots on dark rides, of the fireworks, and at Mickey’s Not-So-Scary Halloween Party. The camera I will use for the first time in Orlando is: Canon EOS 70D. The two main lenses I’ll be using are Sigma 18-300mm F3.5-6.3 DC Macro and Sigma 30mm F1.4 DC Art. I also have a Canon EF-S 10-18mm f4.5-5.6 IS STM Wide Angle Lens that I will also take with me. My main lens though will be the 18-300mm. I also take some photos on my iPhone6 for sharing on social media. Waterpark photos are on my Panasonic Lumix DMC-FT5. Videos are taken on our Panasonic V720. Any questions please feel free to ask, I’m always happy to help!